If you’re a fan of the 2011 comedy chick-flick movie then you’ll love this slot. If not, you can easily look past the pink and cheerful design and still enjoy what this prize-packed game has to offer. The Bridesmaids online slot from gaming powerhouse Microgaming brings all the fun from the movie to the reels, and it can be very rewarding. This game is played on five reels and 40 pay lines and benefits from plenty of bonus action where you can hit huge hauls, too – an impressive 105,000-coin jackpot is up for the taking. Check out the full slot breakdown in our guide below. Play Bridesmaids for Real Money! This is an ideal choice for those with modest bankrolls and those who appreciate rewarding bonus features. 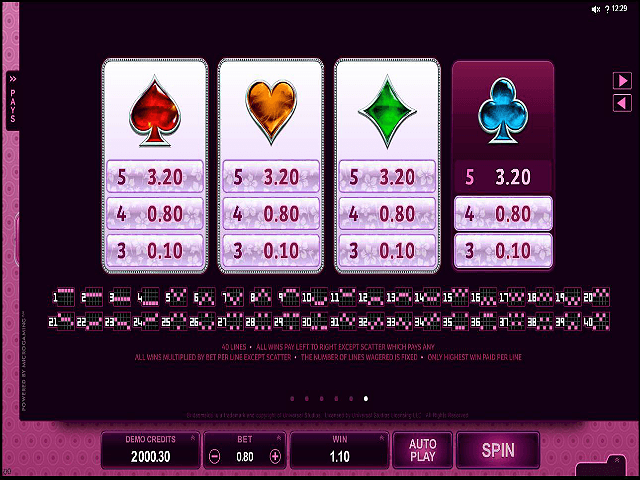 The pretty-in-pink reels and sparkling paylines can be played from just 40p per spin all the way up to £60. There are loads of in-game bonuses that can be accessed through a Bonus Wheel feature. 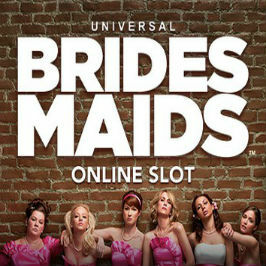 And the Bridesmaids online slot has a very respectable average return-to-player rate of 97%. It’s got plenty of attractive features including hilarious clips from the film and a sweet £8,000 jackpot that could (almost) pay for the wedding of your dreams. The symbols feature your favourite characters from the smash-hit movie with jewel-clad playing card symbols representing the lower values – these pay up to 240 coins for five of a kind. Payouts from the base game come from the symbols of Bridesmaids Becca, Rita, Megan, Helen and Annie and go up to 450 coins. The Bride Lillian pays up to 750 coins. 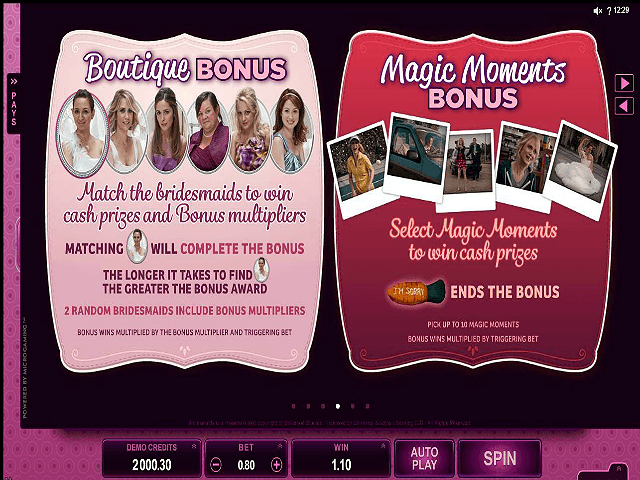 To trigger the bonus features you’ll need to land the Bridesmaids logo for the Stacked Wilds and three Cupcake Scatters to activate the Bridesmaids slot bonus wheel – where the most rewarding wins are played for. All the bonus games of this video slot are accessed through the Wheel bonus feature that can win you up to 15 prizes. The Wheel is triggered by hitting three or more of the cupcake Scatters anywhere on the reels. This will bring up a screen of four cupcakes and a Wheel of Fortune-style wheel where you pick from the cupcakes before spinning the wheel. Here you can activate six possible bonus rounds. A Friendship Free Spins bonus game gives you 10 Free Spins with Stacked Wilds. A Flying High Free Spins round offers 10 Free Spins with rolling reels and Wilds starting as Stacked. This rewarding game can potentially land you 1,750 times your stake. A Boutique Bonus has you pick from 12 boxes with the aim of the game to pick matching symbols with Multiplier symbols. The Magic Moments Bonus game has you pick from 10 photos to reveal prizes – nine of these photos pay out so you should pick up some nice payouts here. The Jackpot game can give you a hefty prize based on the number of cupcake Scatters you hit in this feature. Finally, a Multiplier feature awards a Multiplier value of your total spin bet. Who doesn’t love weddings? Share this Bridesmaids Review today! If you like Bridesmaids, you'll love these slot titles too!